IGATEX Pakistan has now developed into one of the largest and well established garment and textile machinery exhibitions in South Asia. The 12th edition of IGATEX PAKISTAN inaugurated on 26th February at Karachi Expo Centre. The Opening Ceremony has been inaugurated by Mirza Ikhtiar baig along with other Guest of Honors including Turkish consulates, Italian consulates, President IDC, and Presidents of textile associations. Located at the crossroads of Asia, Pakistan has become a focal point for investors in the region having gained recognition as an important market among other textile manufacturing countries of the region. Pakistan is the 8th largest exporter of textile products in Asia. This sector contributes around 8.5% to the GDP and provides employment to about 40% of the 49 million workforce of the country. Pakistan is the 4th largest producer of cotton with the 3rd the largest spinning capacity in Asia after China and contributes 5% to the global spinning capacity. 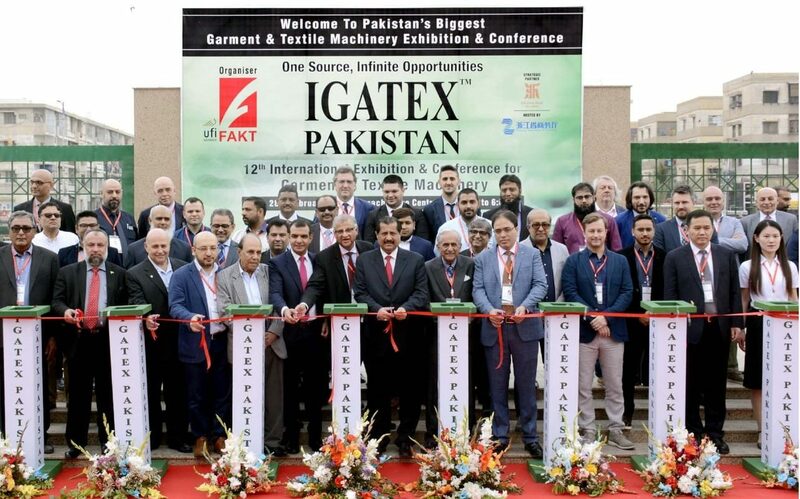 IGATEX PAKISTAN 2019 provides the exhibiting textile machinery manufacturers by providing them an opportunity to directly offer their technological solutions to quality buyers and decision makers in an exceeding competitive global business environment. More than 20,000 trade visitors are expected to meet with representatives of more than 500 textile technology suppliers the world has to offer to deliver their state of the art equipment and solutions. 30+ countries are showcase cutting edge technology and developments in the industry. The visitors at the show will be the key decision makers from the entire supply chain of Pakistan’s textile industry who shall witness the latest innovations and technological trends by leading global technology suppliers. More than 116 Chinese exhibitors form the largest exhibitor group at the exhibition followed by 92 companies from Italy, 75 from Germany, 25 each from Japan and Switzerland. Other countries present at IGATEX 2019 are France, Belgium, Austria, Korea, United Kingdom, United States of America, Brazil, Thailand and many more. The highlights of the exhibition include country pavilions from Turkey and China. Department of Commerce of Zhejiang province in China has organised a pavilion for their best companies to showcase their machinery in textile finishing, nonwovens, spinning and garments technologies. An International Conference is also planned as comprising of local and international experts to share their in depth knowledge with the delegates. The mega event organized by FAKT Exhibitions will forge business relationships with the goal to find new investment opportunities to bring development and progress in the textile industry.